La Paz (officially: Los Robles La Paz) is a municipality in Cesar Department. It was founded in 1775 (wikipedia gives 1700). 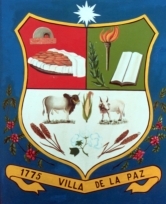 The flag of La Paz show the municipality map in whit dividing the flag with the area close to hoist is red and the area close to the fly is blue. Above there is white stripe charged with 6 res stars.